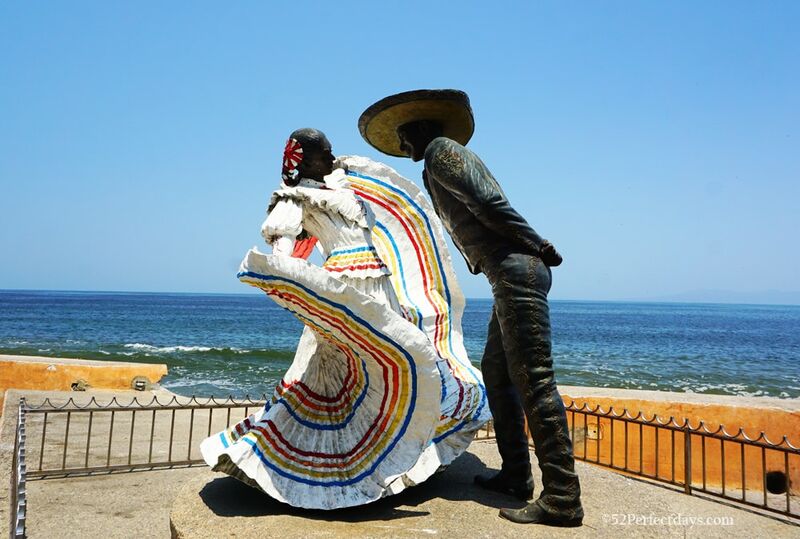 If you are looking for a vacation that offers history, romance and gorgeous beaches in Mexico, don’t look any further than Puerto Vallarta and Casa Velas Puerto Vallarta. With its beautiful blue skies, clear sea, and spectacular sunsets; you can’t fail to fall in love with this city. Puerto Vallarta is a resort town lying on Mexico’s Pacific coastline in the state of Jalisco. Puerto Vallarta offers visitors the rugged, tropical Sierra Madre Mountains, with rivers, cascades, and a steep landscape waiting to be conquered. 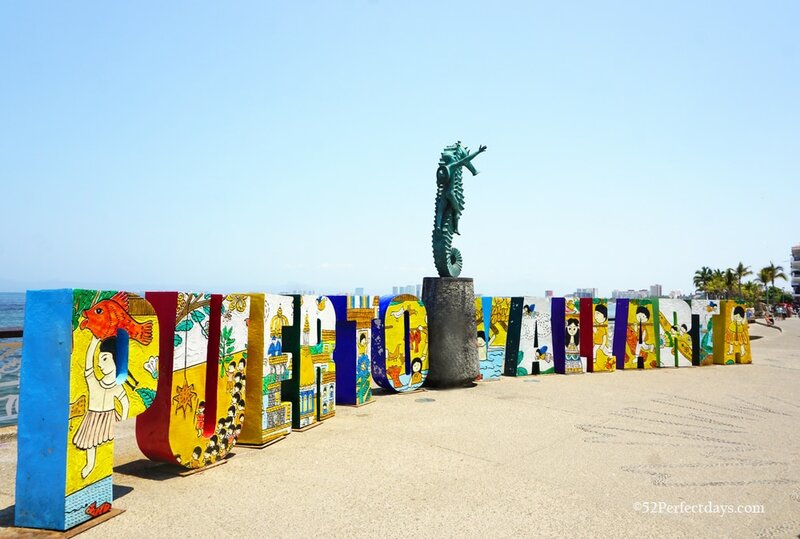 Puerta Vallarta also sits on the Pacific Ocean and Banderas Bay which is Mexico’s largest natural bay and the second largest in America. Just about anything you want to do on a tropical beach holiday is possible here. If you enjoy sightseeing, there are plenty of things to see such as the Botanical Gardens of Vallarta and the ornate Nuestro Senora de Guadalupe church. There are also boutique shops and plenty of restaurants and bars serving delicious Mexican cuisine. The beachside promenade, El Malecon is a great place to take a stroll. It is lined with contemporary sculptures as well as plenty of bars and nightclubs. For those who enjoy water sports, it’s possible to arrange diving, snorkeling, kayaking, and jet skiing. Puerto Vallarta is famous. It was used as a backdrop for the John Huston movie, “Night of the Iguana” starring Richard Burton, Ava Gardner, and Deborah Kerr in 1964. It is said this movie put Puerta Vallarta on the map. It is interesting to note that the star of the film, Richard Burton brought Elizabeth Taylor with him and they played out their passionate romance in this romantic seaside city. 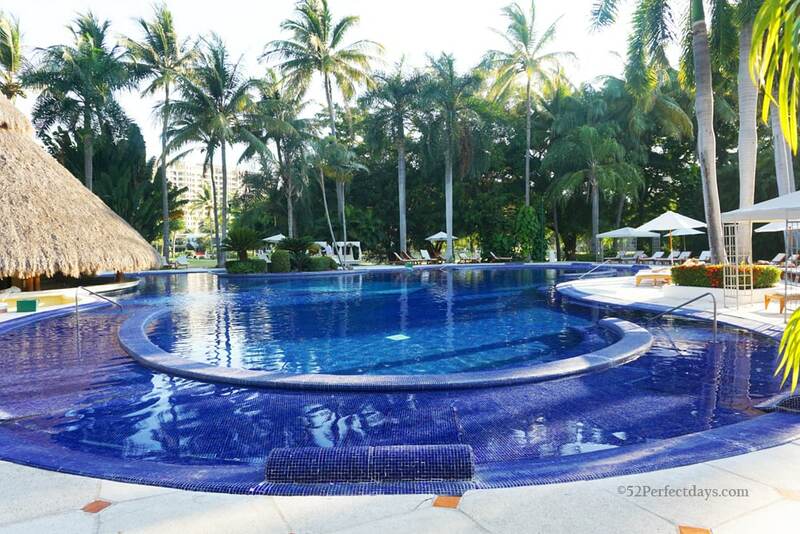 Of course, if you are heading to Puerta Vallarta, you must have the perfect hotel! I’ve got you covered. Below is a review of a hotel I recently visited and highly recommend! Casa Velas is a spectacular adults-only all-inclusive boutique hotel. 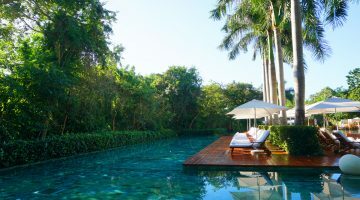 The property is set amidst lush tropical gardens, gorgeous bougainvillea plants, and towering palms trees. 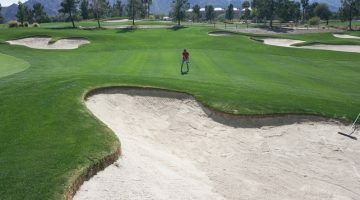 The hotel is situated along the fairways of the 18-hole Marina Vallarta Golf Club which is perfect for golfers. 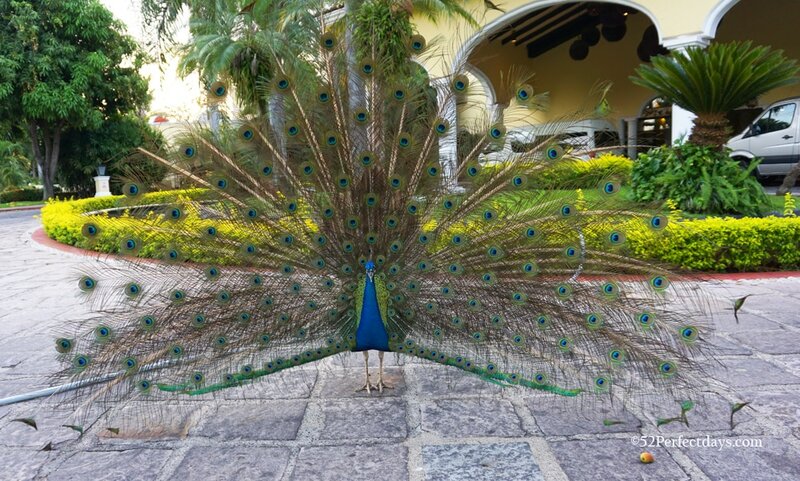 You will find peacocks wandering around the hotel grounds and koi ponds for the ultimate tropical vibe. Casa Velas is just minutes away from the airport and within walking distance of Puerto Vallarta’s stylish 500-slip marina. 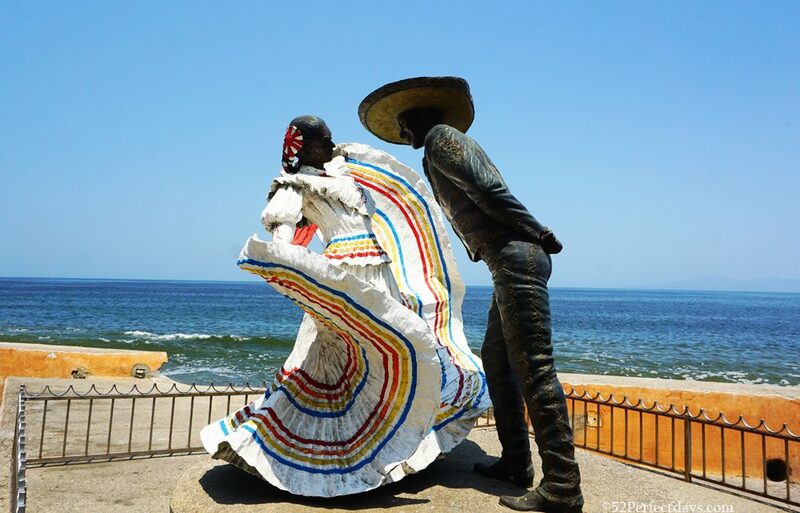 In addition, the hotel is only 15 minutes away from downtown Puerto Vallarta with its art galleries and the boardwalk, El Malecon. The hotel has an excellent reputation and is rated 8th in worldwide hotels by Expedia and 8th amongst the 15 best hotels in Mexico by Conde Nast Traveller. It has been awarded 4 stars by Forbes Travel Guide, making it the only boutique hotel on Mexico’s Pacific coast to receive this honor. The hotel has been in the top 2 hotels on Trip Advisor since 2010, which is naturally very impressive. Casa Velas also belongs to the SLH (Small Luxury Hotels of the World). 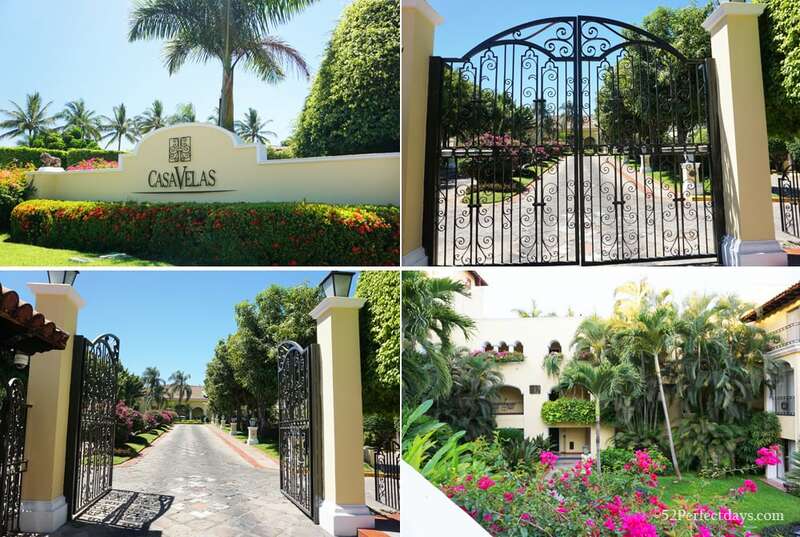 The Casa Velas has 80 luxurious suites, some with either a Jacuzzi or private immersion pool. The suites are tastefully decorated with traditional Mexican design and some also have pieces created by Mexican sculptor, Sergio Bustamante. 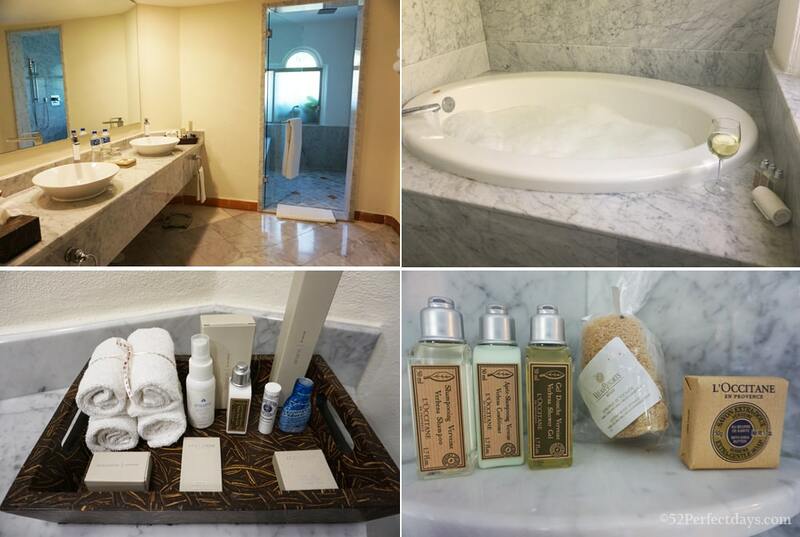 The suites have all the usual amenities you would expect from a good hotel, plus some extra touches. Complimentary Wi-Fi, cable T.V., air conditioning, and a mini-bar are included in the all-inclusive package. All rooms have either a jacuzzi tub in the room, or an outdoor private plunge pool. They offer a stellar pillow menu. Turn down service & leave chocolate every night. Some nights a special treat like choc covered strawberries. You’ll find L’Occitane bathroom amenities including shampoo, conditioner, body wash, soap, and lotion. You’ll also be supplied with balm, mouthwash and bug spray. All rooms come with robes, slippers, and wicker beach bags. There is a turn-down service with a chocolate left on your pillow each night. As a special treat, you might get a delicious chocolate covered strawberry. There is, in addition, 24-hour in-suite dining. 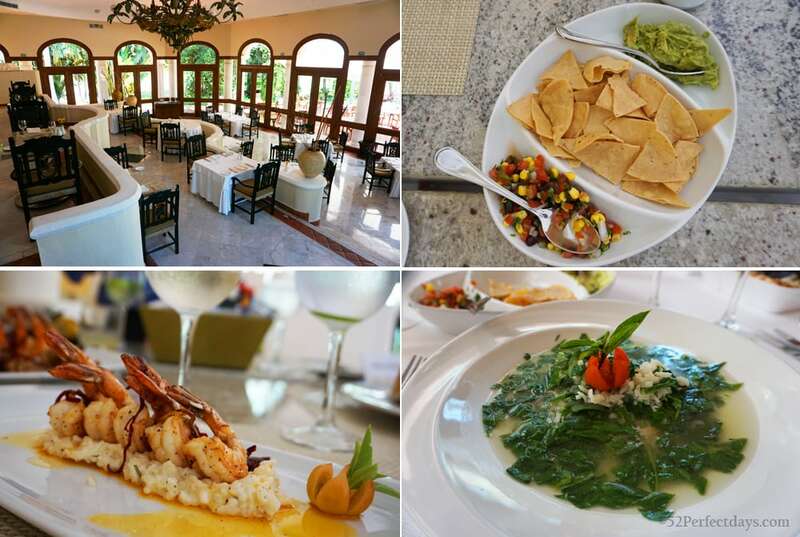 The hotel hosts the gourmet cuisine restaurant, Emiliano where you can have breakfast, lunch, and dinner. It is AAA Four Diamond rated and is run by leading chefs from the area. They serve both Mexican and international cuisine and special diets such as gluten-free, vegan, and vegetarian diets can be catered for. 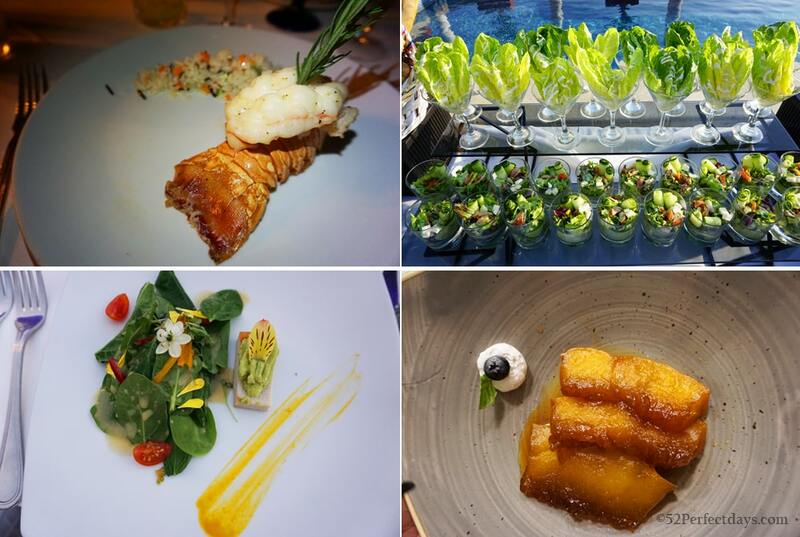 The food highlights the unique flavors of the region and fresh local ingredients are used. Unlike most all-inclusive resorts where buffet dining takes precedence, here the food is a la carte, making you feel all that more privileged. You can choose to eat indoors at the Emiliano or at an outdoor table surrounded by koi ponds. What could be more romantic? The dress code at Emiliano’s for dinner is elegant-casual. Men should wear a collared shirt, trousers and closed footwear. Women should wear dresses, skirts, or evening trousers. Beach sandals, tank tops, and shorts are not allowed. Guests can also take advantage of dining at the sister resort to Casa Velas, Grand Velas Riviera Nayarit where you can choose between three gourmet restaurants. There are two main bars at the Casa Velas; the lobby bar and the aqua bar where you can swim to the bar to order a drink and food. In addition, there is the handbag bar where you can enjoy the use of a loaner designer handbag. What fun! 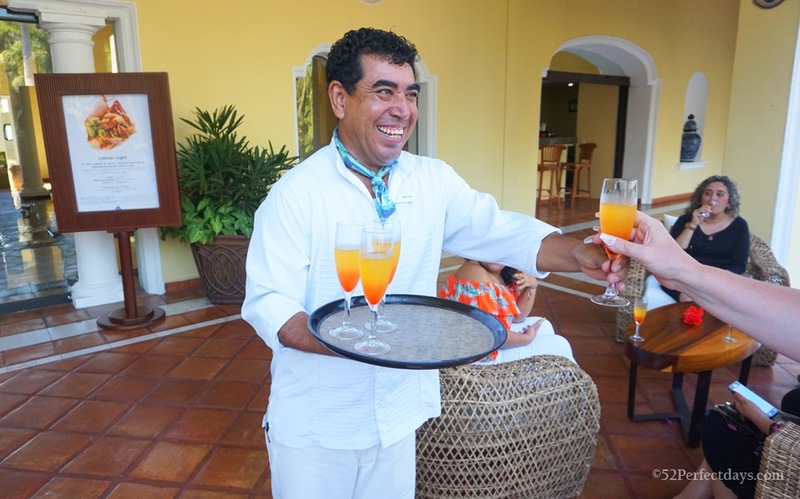 You will find that the staff at the Casa Velas are excellent. They are warm, welcoming, and helpful, and offer great service in all aspects of the hotel. Nothing is too much trouble for them. 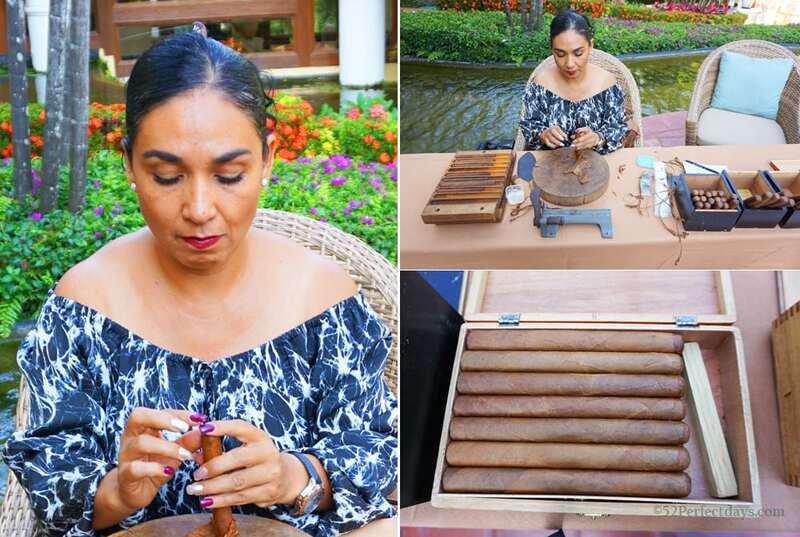 Every night in the bar there is an activity on offer such as beer tasting, cigar making, or learning how to make cocktails. There is also live music and a cocktail happy hour. The hotel has a huge crystal clear swimming pool. There are lots of different options for lounging at the pool including chaise lounges and cabanas. Because of the palm trees, you can always find a shady spot in the pool, which I loved. Of course, the swim up bar is the best spot to grab some shade and a cocktail! For those of you who like to keep in shape, you won’t have to worry about missing gym time while you are here as there is a state-of-the-art fitness center with a beautiful garden view. In addition, you can attend yoga classes in the gardens. You have golf right on your doorstep, but the Casa Velas also offers complimentary golf at three nearby signature designed 18-hole golf courses. What could be better for the golf enthusiasts out there? If you are in need of rest and recuperation, head to the spa where there are treatment rooms for both singles and couples, a hydrotherapy area, and a beauty salon. 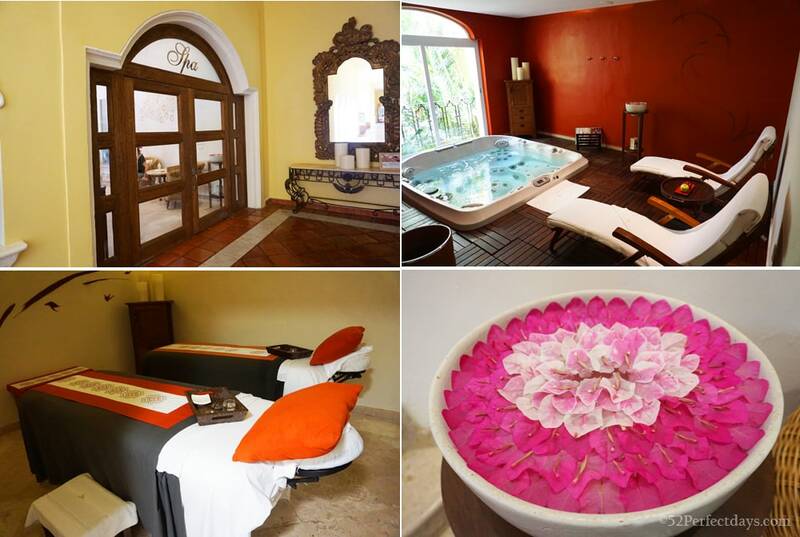 The SPA Casa Velas is a world-class spa and health retreat. You will be offered regionally and internationally inspired spa treatments to revitalize you, and you will receive the treatments from professional spa therapists. The signature treatment uses herbs and seeds from the hotel’s own gardens. These are made into a compress which soothes the body. The Casa Velas has a private Ocean Club just a couple of minutes away and there is a free shuttle bus which makes life easy. Here at the Ocean Club you will find a swimming pool, Jacuzzi, and a beach. There is also a restaurant which serves up a great variety of Asian delights. 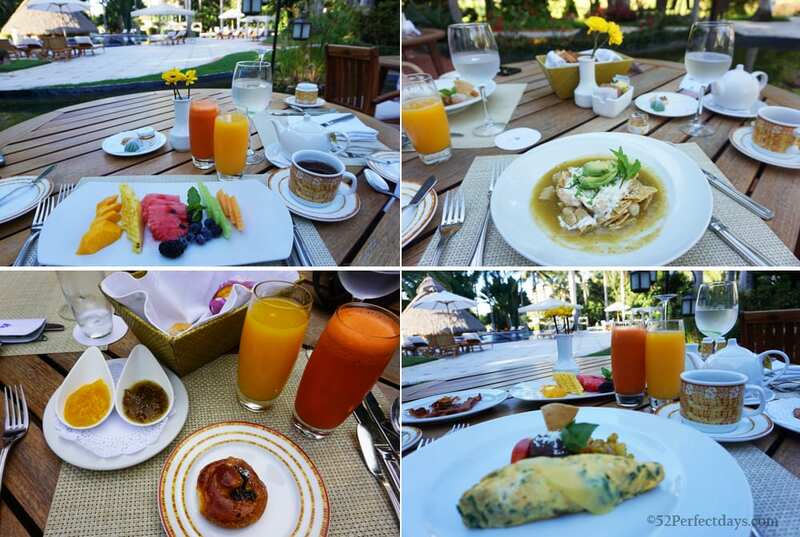 In addition, there is an organic garden supplying fresh herbs, fruits, and vegetables for the restaurant, bar, and spa. This is a sister property to the Casa Velas which you can also use. A free shuttle bus is provided between the properties. The Vellas Vallarta lies in a 10-acre beachfront plot of land with magnificent views of the mountains. There is a tropical garden which has three swimming pools, a waterfall, a swim-up bar, and a resident iguana. Here you will find extra restaurants serving an array of dishes, from Mexican and Italian, to seafood and themed dinners. 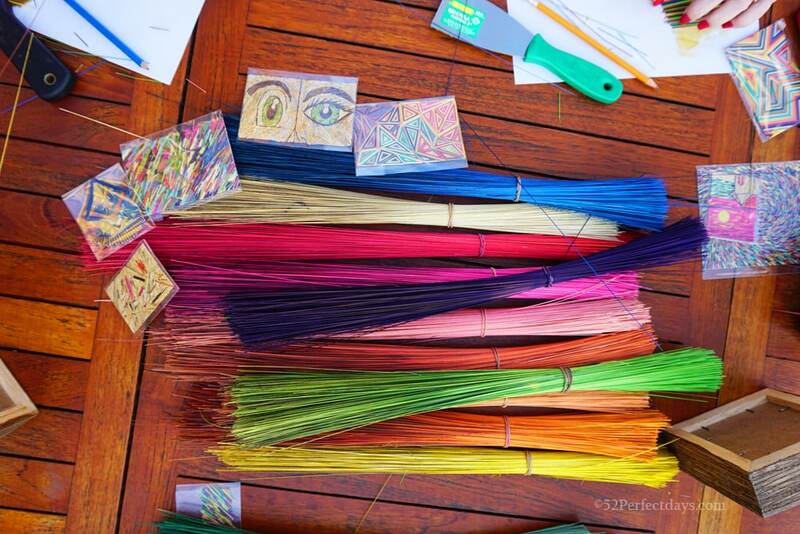 Each Monday there is a wine and painting class at the Ocean Club with Leon de la Vega. The hotel is family friendly. Puerto Vallarta has a warm tropical climate all year-round. 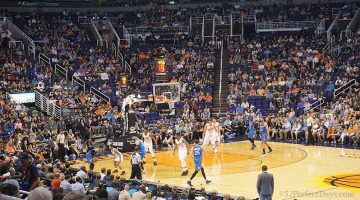 The average daytime temperature is 80F, with cooler evening temperatures in winter months. 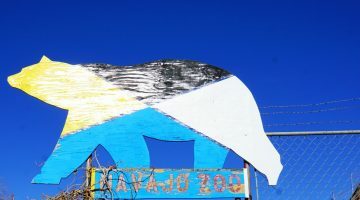 It is easy to get to Puerto Vallarta from both the U.S. and Canada. November – May: – This is the dry season. There is very little rain and the skies are generally cloudless. The daytime temperature ranges from 78F – 85F, while nights are between 55F – 60F. June – October: – This is the rainy season. It starts in mid-June and the rain increases until there are daily downpours from July until September. Most of the rainfall comes in the late afternoon or during the night. The total rainfall in the city is 45 – 60 inches a year. Average temperatures during this season are 88F – 93F and it feels very humid. If you enjoyed this article about the Casa Velas Puerto Vallarta Hotel Review, you’ll also love Best Things to do in Rosarito Beach, Mexico. How to get there: Arriving by plane to Puerto Vallarta from Mexico City takes about 1 hour and from Monterrey, it takes 2 hours. Most of the Mexican airlines have direct flights to this holiday destination. 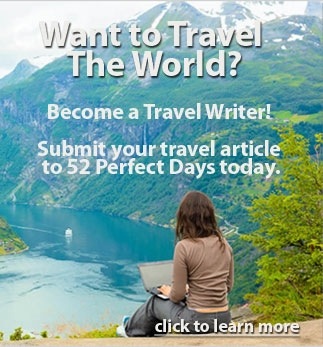 Find cheap flights Check Trip Advisor for the best flight to Puerto Vallarta. 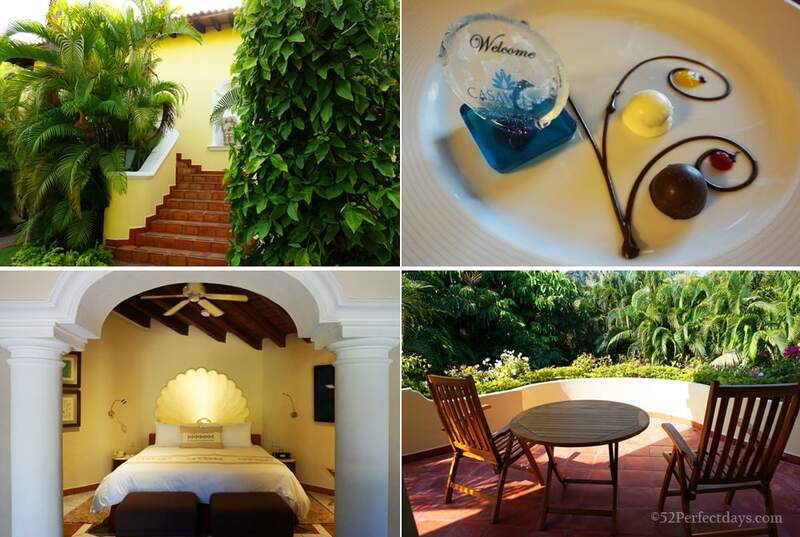 Where to stay: There are many places to stay in Puerto Vallarta. There is a wide range of hotels, from budget to luxury. For a luxury hotel that won’t break the bank, I recommend the Casa Velas which is currently the #1 hotel on Tripadvisor. You can also check Hotels Combined for the best Puerto Vallarta Hotel Rates. Hotels in Puerto Vallarta: Check Trip Advisor reviews for Casa Velas. 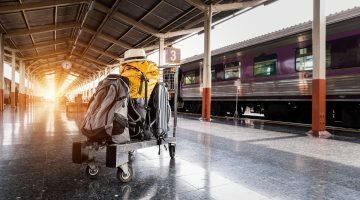 What to pack: The temperatures each season vary, but even in winter, it can be warm and you should always prepare for rain. 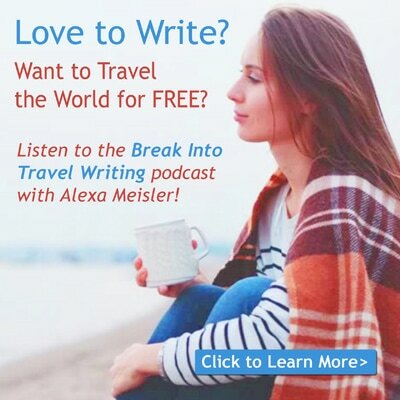 You will want a waterproof outer layer, rain jacket, and travel umbrella. You’ll also want a good pair of walking shoes (I love Keen). If you are visiting in Winter, you’ll want to pack layers including a light sweater or scarf. Get the Fodor’s Puerto Vallarta: with Guadalajara & Riviera Nayarit. Bring a good quality mirrorless camera for getting those beautiful Casa Velas beach landscape shots. I use the Sony Alpha a6000 . 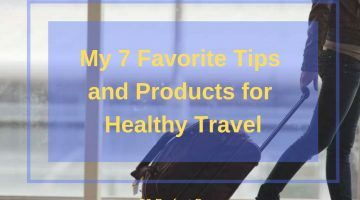 A great cross body travel bag . Cross body bags prevent theft and are much easier to access.